The 2019 cookoff springboards off the success of our sold-out 2018 fete with a beer and wine bar, live bands, and up to 35 meat and vegetarian chili entries from the area’s best amateur and professional chefs on Sunday, February 24, 2:00 – 5:30PM at The Woodland. Can I bring the kids, you ask? You sure can! We’ll have kid-friendly activities, baked goods for sale, and best of all, kids under 12 can come for free! Thanks to the generous support of lead sponsors Vanessa Pollock Properties Group, Kings Market and BCB Bank, and additional sponsorship from The Able Baker, The Fox and Falcon, SOMA Brewing Co, Wine Barrel, Chaise Fitness, and the South Mountain YMCA, we’re able to donate 100% of ticket sales and bar profits directly to the Interfaith Food Pantry of the Oranges. Visit our website www.maplewoodchilicookoff.com for tickets and event info. We’re giving away more prizes than ever this year! We’ll be handing out 1st – 5th place prizes in the meat category, 1st – 2nd in the vegetarian, 1st place in the kids category, and a new chef’s choice award. Top prize in the meat category is $500 cash! 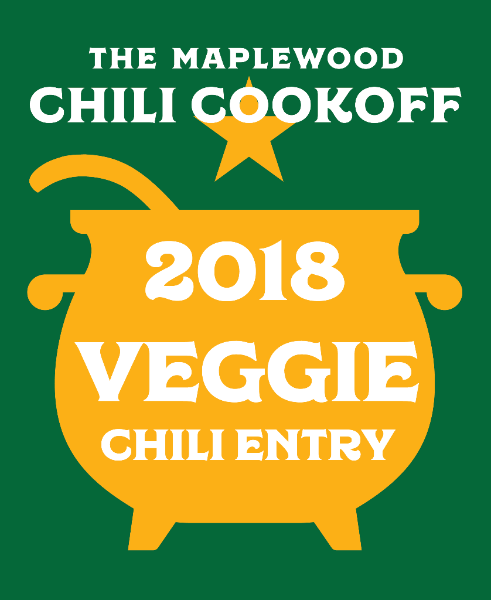 Best of all, 1st place winners will have their name immortalized on The Maplewood Chili Cookoff’s iconic cauldron trophy, which sits on permanent display in the lobby of Maplewood Town Hall. Full prize list and entry info here. Enter a Meat Chili Find out how your best pot of red stacks up against the best amateur and professional chefs in town. Register here! Enter a Vegetarian Chili No meat? No Problem. Your chili is welcome here, friend. Welcome to the Vegetarian category! Register here! Want to host a lawn sign? Email [email protected]maplewoodchilicookoff.com and we’ll take care of the rest!